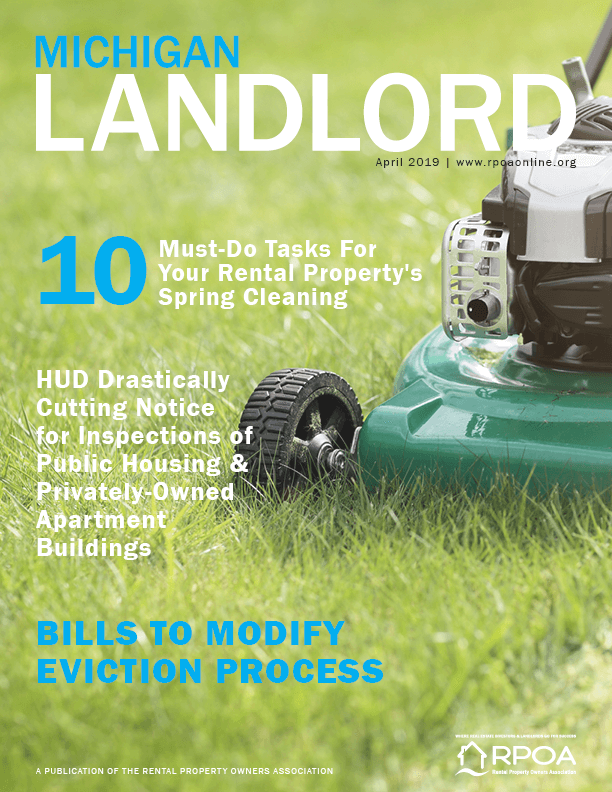 The April Issue of Michigan Landlord Magazine Is Here! We carry the most frequently used rental and real estate investment forms. RPOA members have access to a majority of our forms that are available online for free or a hard copy can be purchased for a small fee. Members also have access to sample letters and addendums. Rental Hero is a simple, online accounting software designed specifically for rental property owners by rental property owners. RPOA members pay only $7.95 per month, billed annually at $95 and your first year is only $79! Join our host, Brian Hamrick, for weekly candid and life changing conversations with experts from the real estate investment community. Michigan’s Largest Real Estate Investor and Landlord Association – Serving Landlords, Property Managers, Real Estate Investors, Flippers, Buy and Hold Investors, Wholesalers and More. Join the RPOA Today for Success! City Proposes Changes to Fair Housing Regs in Grand Rapids: Public Hearing April 23 at 7:00 p.m.
Members of the RPOA have access to dozens of real estate investor and property management forms. A majority of the forms are free fillable PDF's that can be downloaded online whenever you need them. Most of the forms are also available for purchase as hardcopy. Save $1,000's with Member Discounts. RPOA members are eligible for discounts from a wide variety of local and national companies...many exclusively available to RPOA members only. It pays to be a member of the RPOA! Looking for a place to connect with like-minded investors face-to-face? What better place than a networking group! The RPOA sponsors three evening Meet Ups each month and one weekly morning breakfast networking event. Connect with over 300 investors! Michigan's Largest FREE Real Estate Investor & Landloard Conference & Expo. Features national speakers, breakout sessions packed full of current and wealth building strategies and techniques. The fastest and best way to get started in any business is to learn from the experts. The Professional Housing Provider (PHP) program is an excellent way to gain an in-depth understanding of investment and management practices and build credibility in the community. Most of the courses also offer continuing education credit hours for licensed real estate professionals in Michigan. Those completing the courses will also receive a designation as a Professional Housing Provider through the National Real Estate Investors Association (NREIA). We offer three ways to do tenant screening—one absolutely free for the property owner. Have your prospective tenants pay and share their credit and criminal report with you or obtain a decision report or full credit report via services provided through the RPOA for a small fee. Sign up for the free service here. (https://rpoa.applyconnect.com/) Contact the office for additional services. Free Credit Reporting - Tenant Pays for their own report. Get access to full national credit and criminal reports from your home or business office. Members can contact our attorney's office for free limited legal advice or our office staff for answers to tough questions. The RPOA has been around for 50 years helping investors and landlords with their everyday questions on property management, evictions, fair housing, state and local landlord-tenant law, and more. We’re here to help you 5 days a week! And, if we think you need legal advice, our attorney will provide you with FREE limited legal advice over the phone. Weekly candid and life changing conversations with experts from the real estate investment community. Produced by the Rental Property Owners Association. Hosted by Brian Hamrick.